1oz of pure silver issued by the Austrian Government. A 2011 silver Philharmonic coin. Coin shows toning and light scratches. 3BTC includes shipping to Canada or US. I will ship elsewhere for actual shipping costs. Since I am new to selling here I will ship first if you can demonstrate a history of honest trade on the forum. I might be interested. Can you post a picture? What are the shipping costs? I'm in Hawaii. If you'll ship it first, I have an established rep here and will take it for 3BTC including shipping to Canada, payment to be sent when the coin is received. Let me know if you accept and I will PM you my shipping info. I would, but I already sold it. I will post a picture for my next one. The price included shipping to the US. Hawaii is included in the US as far as I am concerned. I would have accepted that offer, but I have already accepted another offer. I have not been paid yet so if it falls through I will see if you are still interested. I appreciate the fast payment. May the postal Gods move swiftly to you mailbox! Are you planning on offering gold for sale after building your rep with some more of these successful "trades". Yes I am planning to sell gold here eventually assuming my first few batches of sales works out well. I am not diving into this marketplace, I am dipping my toe in the water first. I am currently involved in a trade with a very well established forum member, I am not sure if he is a merchent or why that matters. His package is currently in the post. I sent first to this person and I expect payment and feedback from him once it arrives next week. By the way you put "trades" and "person" in qoutes I think you are implying that I am engaging in sock puppetry. If I am misinterpreting you please correct me. If I am not misinterpreting you I think that you are insulting btc-bullion more than a little bit. Look at his post history and you will see he does in fact have an established record of buying bullion from other members of this community. His post history indicates intelligent contribution to the information and economy of this board. I think he deserves better than being accused of being imaginary. I think you are probably being very smart by engaging in skeptisism. The phrase "I will beleive it when I see it" comes to mind. I would love for you to see my silver. I have another silver 1oz Philharmonic, or if you prefer a silver 1oz Maple leaf. They are both in untouched condition and stored in air-tite plastic containers. I see you are indeed an established member who has demonstrated a history of trade without incident and will gladly send you silver based on your promise to either pay for or return the items upon receipt and inspection. If you want either coin or both I will send first. At the current market prices of bitcoin and silver I would like 2.9BTC per coin and .2BTC shipping. Once you have them and have inspected them you can pay me and put your concerns to rest. If you do not want to buy then just wait and someone that you likely trust will report of his receipt of my silver. Let me know either here or by private message if you are interested. Edit: Nothing personal c0ffer, but I prefer less extreme customers so I am going to retract this offer. No hard feelings. The reason why I have brought his up is because not too long ago a member of this forum made a bunch of trades for precious metals, building trust, only to take off with a pile of coins after taking some gold orders. His claim was that his account was hacked but evidence later showed that there was no account hack, just a con. I was taken for a half dozen coins but others were not so lucky. Savvy forum members can tell that trades done between new people with low post counts do not mean much for rep, but newer or less savvy users may not be so knowledgable. The previous scammer actually conducted some legit silver transactions before he made off with money from his victims that was intended for the purchase of more metals (silver and gold). You wanted to gain rep through your transaction yet you chose to sell to a new member of the forum rather than an established member. Your sign-up dates for this site are less than one month a part. You post in each other's threads to support your efforts. You supposedly both buy and sell precious metals. You had similar tastes in avatars until I mentioned the possibility of your being the same person. These are all disputable things, which is the joy of this site, but I do know when to exercise caution and thought I would offer that caution to other users of this forum. If I am wrong, then so be it, but all evidence right now points to things not ending well in the not-so-distant future. Thank you, but I will pass on your offer. I just wanted to confirm, I am expecting 5 ounces from J-Norm. He has shipped first. I will be sure to update here when they are received. c0ffer has proved himself to be a troll, and not very good at investigation. A few screenshots of last login times and he is a modern day internet detective throwing out more innuendo then truths. I have seen your posts, and my opinion is that you are looking to throw doubt on you "competition" that actually sells silver for spot prices and not the outrageous prices that you try defending. I have done purchases on this forum with moderators like SaltySpitoon as well as big names like TangibleCryptography (we are currently working a 100oz trade) as well others like Dank and photoa6155. J-Norm has always had reasonable prices on his items and that is why I am a frequent buyer of his items instead of yours. With J-Norm's permission I would like to post a photo of the envelope in which i received my Philharmonic as well as a photo taken by photoa6155 before sending me another package. If that is not enough actual evidence for c0ffer then I really don't care. PS. Fighting on the internet is like the special olympics. You might win, but you're still retarded. Please do post that picture, show the postmark. Show how I live in one country and you live in another. Show how it went through customs. Then I would hope that he apologizes to you at least. If that is not proof enough then perhaps he thinks I am also TECSHARE. I don't think I am going to put up any further offers until people start reporting receipt of what I have already sent. The proof is in the pudding, the fact is that I have not asked one person to pay up front so I am the one taking on all of the risk. I am not expecting trust here which is why I am extending credit to other members. While the post-count of btc-bullion is not huge the content of his contributions made me think I could trust him over a few bitcoins. So far he has paid promptly upon receipt. I have taken 6 orders from 4 people so far. I have feedback from one of those orders. I will wait until they have all been acknowledged before listing any more silver. I will accept private messages if you are interested in dealing in the meantime. I do not want to dwell on this matter, I merely wanted to share what I have observed and I think the point of my posting is now being missed and overshadowed. Although I have made a couple of silver offerings in the past, I would hardly say I am in competition with any of the metal sellers here. I am definitely a silver buyer though and I do understand it can be difficult to get started here as a seller (check my earliest posts and you will see). However, it is the scammers on this forum that make it more difficult for those of us who are trying to make an honest go of selling merchandise and contributing positively to the ecosystem. I have previously purchased from new sellers and will continue to do so while also supporting established sellers of metals. If I can contribute to the prevention of a potential scam and avoid a future "heavymetal" or similar incident, then that is how I will go. If I am wrong, then again, so be it. I think it may be a moot point to retract an offer that I declined, but there is no need to continue on an issue that is put to rest for now. 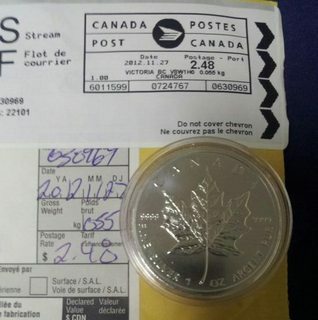 For the record, I purchased a Canadian Silver Maple Leaf from J-Norm on the 26th for 2.88BTC (plus .2 for shipping). I sent first. I'm very pleased with the exchange; I would purchase from him again. Thank you very much for the exchange. I will be putting more listings up in a week or so but anyone can send me a private message if they want something in the meantime. I have all sorts of stuff. I got my Philharmonics today, they were as described and arrived quickly. Thank you very much, will deal with you again! Glad it worked out. I am going to put some though into your private message. Thanks. Thank you for your prompt payment upon receipt.